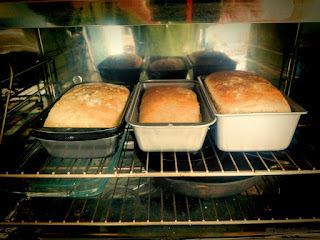 My last two batches of bread haven't risen. Like, at all. I finally decided to spend a little time figuring out what's going on, and it turns out, it all comes down to temperature (at least it did for me). There are quite a few reasons why dough might not rise (dead yeast, other ingredients killing or impeding the yeast's ability to work properly, etc. ), but temperature is probably the most common issue. I knew temperature mattered, but what I didn't realize was just how small the window for error is. 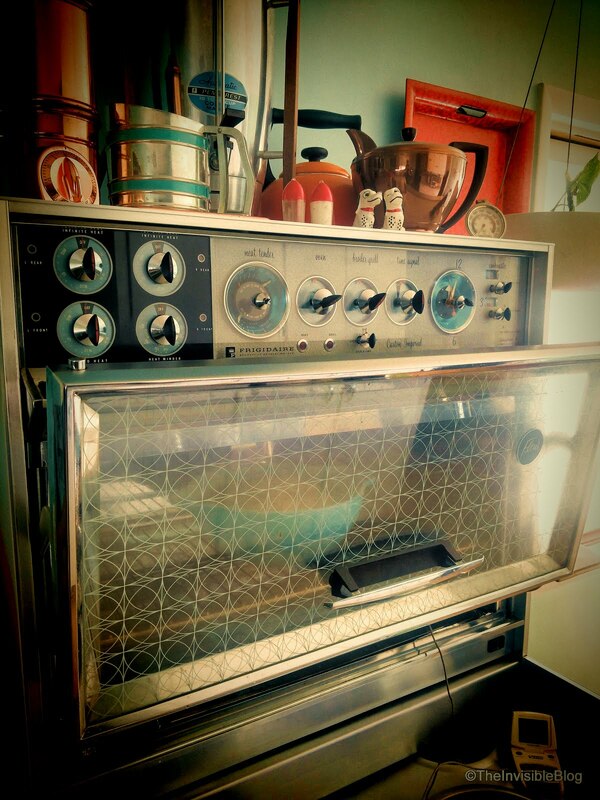 I run hot, so I tend to keep my house pretty cool, especially in the winter (when baking is more fun). I also consider myself way more of a "cook" than a "baker." As such, I'm used to winging it, shooting from the hip, improvising, experimenting, and being altogether way more reckless than is acceptable with baking, where apparently you have to stick to the rules a little (or a lot) more. I've got an insanely delicious Oatmeal Bread recipe from my mom/aunt that reminds me of childhood and all things good in this world. The recipe says you should put a package of yeast in 3/4 cups of lukewarm water with 1/16 teaspoon of sugar and 1/16 teaspoon of ginger. There are two problems with this. 1. "Lukewarm" can be quite different from one person to another. 2. Ginger is actually an anti-fungal, and yeast belongs to the fungus family! I wonder if the pinch of ginger is to keep the dough from going crazy. A kitchen that is in constant use is warm or even hot, and my mom and aunt's kitchens were certainly that way. So maybe they needed something to actually keep the yeast in check. My 64 degree kitchen doesn't need any help. It will keep yeast from "doing its thing" on its own. And then there's this idea of "lukewarm." In my research, people suggested yeast should proof anywhere from 70 on the low end, to 105 on the high end. I think the window is even more narrow. I decided to experiment with temps, by placing yeast and sugar into some water at "room temperature" (my room temperature) and then bringing the temp up slowly to see where the yeast started to get happy. 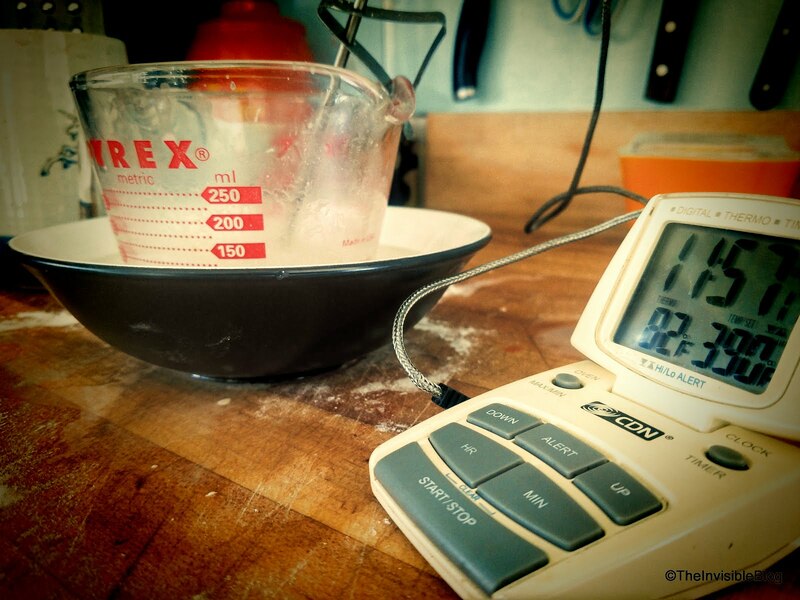 Sure enough, even though I was starting out with warm water, by the time it hit the (cold) pyrex measuring cup and I added yeast to it, it was sub 70. I placed my thermometer in the pyrex measuring cup and then placed the measuring cup in a bowl and began to incrementally add water from my instant-hot tap. I was surprised to see that even around 75 degrees, not much was happening. 80 was better, but it wasn't until around 90 that things really started to happen. So from now on, I will be sure that my yeast water is at 90 degrees. The other thing I have to worry about in my cold kitchen is the temperature of the mixing bowl. I didn't think that would make much of a difference (thinking it would only drop the dough's temperature a tiny bit), but I was wrong. 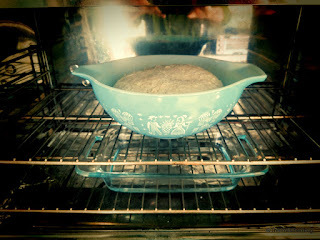 From now on I will be warming the bowl with hot water and then keeping it in an oven set for proofing. The final element of fixing my dough-rise problems is actually using the oven to "proof" (placing the kneaded dough in an oven set at a relatively low temperature specifically for rising). 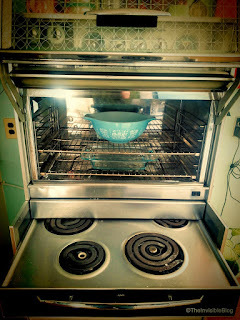 I had been doing this already, but not really paying much attention to getting the oven warm enough or keeping it there. If you don't have an oven that does well for proofing, there are a couple of tricks you can try. My oven doesn't really start keeping temperature until it's around 125 degrees, which is a bit too high. Therefore, I set the oven as low as I can to where it will kick on and off (you can watch the indicator light or listen for the "click"), and then I just keep the door open a bit. This will cause a greater fluctuation in temperature, so to combat that, I simply placed a couple of my iron skillets on the bottom rack to assist with keeping the temperature constant (the skillets act as heat sinks). I used my thermometer to monitor things, and I'm able to keep the oven interior at about 100 degrees, which seems perfect to me. Finally, and especially with the door cracked open, you will want to add an element to keep the rising dough's atmosphere moist. A lot of people place a damp towel over the bowl, and while that helps a bit, I have started placing a shallow pan of hot water on the bottom rack where the iron skillets are hanging out. Not only that, but I leave the water there when baking the bread, and I've found it really helps with the consistency and texture of the bread! So that's it. If you're having trouble getting your bread to rise, and you know your yeast isn't dead, chances are things aren't warm enough! I use my old HTC Droid Incredible for a media player. I would TOTALLY still use it for my main phone if it weren't for the fact that it maxes out at 3G and Verizon has stopped allowing older devices to be activated. I love, love, love it's small size, and I also love the optical joy stick. PLEASE, oh world's makers of phones, bring small phones and the optical joy stick back!!! Anyway... I have ripped my hundreds and hundreds of CD's to FLAC. That means I need a player that will handle FLAC files. The native Android player on Gingerbread does not support FLAC (or much of anything else). After a bunch of research, I've landed on PowerAmp as my app of choice. Now comes the problem. Google Play no longer supports Android Gingerbread, and my Droid Incredible is running Android 2.3.4. I just want to play FLAC files with my beloved Droid. "Google quit supporting Android 2.3 so you may have to find and download older Play version"
Yeah. Thanks loads for all the help. So I can't download PowerAmp via Google Play (what is called "Market" on my phone). I also can't side load the PowerAmp APK to my Droid because Android 2.3.4 doesn't have a file browser, thus if I drop the APK onto the phone via USB from my computer, there is no way to get to it from inside the phone. Even if you put it in the "Downloads" folder (to which Android 2.3.4 does allow access), the APK file won't show up because it wasn't put there by Android's Downloads Manager! Furthermore, I can't download the app from the PowerAmp website, because the only way to access the internet from the phone is via the baked-in "Internet" app on Android 2.3.4. That app does not support secure web connections (and thus really shouldn't be used to access today's internet, except my hand is currently being forced). After searching for a work around, a long and convoluted process that I won't bore you with, I figured out a way to get things done. I used my back up app (MyBackup Pro) on my everyday phone (a Moto Droid Z Force) to create an APK for both PowerAmp and the PowerAmp Unlocker that were on that phone. Thus I was able to download the two APK's via the "Internet" app on my Android 2.3.4 device. Since they were downloaded in a way Android approved of, I was able to access the APK files via the Downloads app. When I clicked both APK's, I verified that I wanted to install the apps, and BANG! I'm running PowerAmp on my Gingerbread device. For as long as I've been using my MacBook Pro, my Bluetooth has been abysmal. I run Windows via Bootcamp, but my wife uses her MBP as a Mac and she has the same problems (maybe worse). She got a nice little Jawbone Jambox Bluetooth speaker for Christmas and never even used it, because she couldn't ever get it to connect to her MBP (and for me to get it to work, it took some serious effort, and even then the performance was sub par). I have several audio solutions set up around the house and studio, and Bluetooth is a fairly substantial part of the system(s), so today I decided to finally figure out what is going on, once and for all. Click the Advanced tab, go to Bluetooth Collaboration, and select "Enable" from the Value drop-down menu on the right. After a lot of research, this seems to be the solution that works for most people. And while it did help my problem, there are still major problems with my Bluetooth connection. What it boils down to? ANYTHING electronic (yes, I understand the computer is electronic, and that actually IS a factor!) will interfere with the Bluetooth Adapter's signal. It really is just a matter of the Bluetooth hardware in earlier MacBook Pros being utter and total shite. After I completed the steps above to enable Bluetooth Collaboration, I still had issues. I tried rebooting. I tried altering other settings with both the network adapter and the Bluetooth devices (drivers on the MacBook as well as the devices themselves). Then I remembered reading previously that a lot of people had problems with actual signal interference. The MBP power block was sitting on the table (not near enough for me to think it'd be an issue, but still... on the table). I moved it, and like magic, the music streaming over Bluetooth stopped stuttering. But as soon as I started using my mouse (connected via wireless), the stutter started again. So I unplugged the mouse receiver, but that didn't seem to help... and then I actually turned the mouse off via its physical switch, and the signal was smooth again... until I tried looking something else up on the web (using the MBP track pad instead of my mouse), when the stuttering started again. So I am now better than where I started. After enabling "Bluetooth Collaboration" for the network adapter, I can at least walk away from the laptop and stream a smooth music signal to my Bluetooth receiver and stereo. However, if I touch the computer or put anything electronic anywhere near the MacBook, the signal will be interrupted and stutter like crazy. I recently picked up a Hamilton Beach FlexBrew (49983) at the thrift store for $8. Not bad for a coffee maker that still costs $90 at Kohl’s, Target, Amazon, etc. It worked when I plugged it in at the store, but after a thorough cleaning at home (without submerging! ), when I plugged it back in, the display simply read E03. Sometimes when you get these errors with various electronics, you can plug the machine in while holding down a button or combination of buttons, and the machine will reset itself. I tried all kinds of combinations, and while I could get the error to change to E08, I couldn’t make it go away. I assumed the error was a result of water getting in somewhere it shouldn’t have while cleaning the coffee maker, so I waited several days for the unit to dry out. After three days, the E03 error persisted. There is no information regarding this error (or any error) on the Hamilton Beach website, and from what I can glean from reports from customers who have contacted Hamilton Beach directly, they won’t tell you what any of the error codes mean. It seems like Hamilton Beach should post a list of error codes so that people (or at least technicians) can diagnose what is wrong. Since I couldn’t find any information on the web, I tore the machine apart looking for loose wires or broken solder connections, but I found nothing. However, while working on the machine, some strange combination of actions “released” a bunch of water from the spout on the single cup side. The water had not come out when I simply turned the machine upside down, but when I turned the machine over and over while looking for screws to open it up, I must have turned it in a way that allowed the water to come out. So… it would seem the E03 error has something to do with water being trapped in a reservoir or tube somewhere, and that water can’t be drained simply by turning the machine upside down. Thus, the “fix” is to turn the machine over and over in all directions, until water comes pouring out of the single serve side spout.